Topic: Faces of the WAAAAGH!!! Re: Faces of the WAAAAGH!!! like many I'm on sort of a necron tangent and I'm trying to find a way to magnetize feet, a head and sort of a metal skirt that would drape over the top to turn monoliths into stompas. 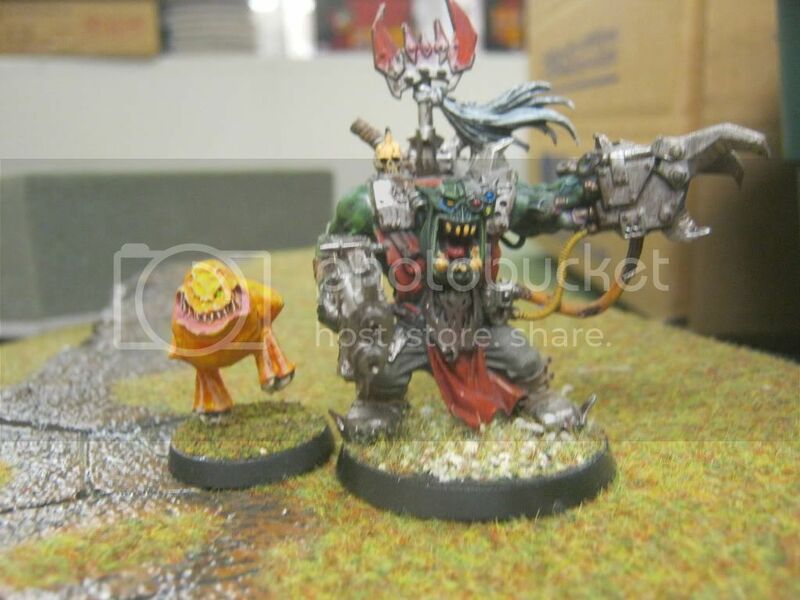 I've been playing 40k since Rogue Trader, never used to like orks because of things like the "Goff Rock Band", so played "serious" armies like Eldar for years, on and off. I tend to oscillate between 40k and fantasy with varying degrees of motivation, and have many many armies on the go, in various stages of completion! Red wuns may well go faster, but yellow wuns have leather seats. Yellow is the new Green . . . If we don't end WAAGH, WAAGH will end us! Will modify and add pics later on! Don't botha me! I'm workin' on sumfin'! I am hoping to add a lot more Forge world items into my standard list as Games Workshop prices here in Australia are just ridiculous ! 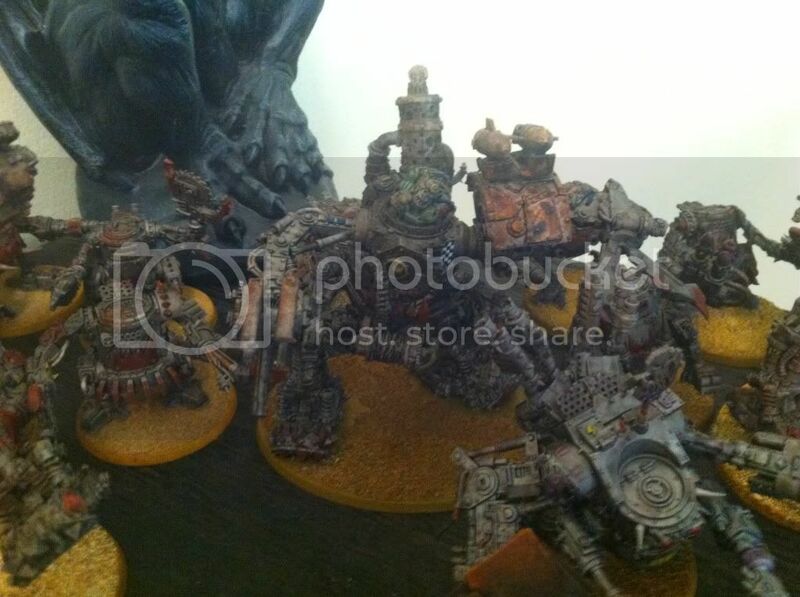 Ok then, I have collected orks for a little while now, but haven't played much with them. No longer, I am starting to go green properly and take my army and join a wwaaggghhhh! Be nice to nerds, you'll probably be working for them. What if by 'fly you fools' Gandalf was actually telling the fellowship to call the eagles and fly to Mordor? "Thunder rolled... It rolled a six"
'ere WE go, 'ere WE go, 'ere WE go!!!!! Howdy! Here I go by Ork E Nuff. 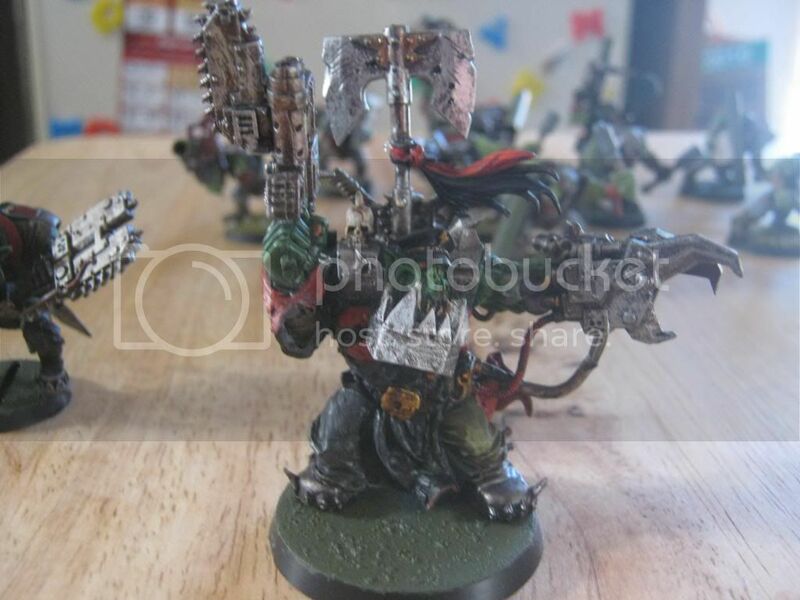 I've been collecting and playing orks for over 20 years. I've collected and gotten rid of more figures than I can remember. I enjoy kit bashing and converting; I'll have to get more pictures and post as I can (how do ya post pics on this site?). I hope I can be of use to the community. My games are usually 50/50 in the win/loss bracket. I just enjoy playing as I find it relaxing and fun (isn't that why most of us got into the hobby to begin with?). Blood n Guts is nuffin more dan bio-d-gradible axle grease.....Remember, that which does not kill you, will only try harder the next time...I've named me attack squig "Skippy"....is that wrong? You Boyz wanna live forever?! Waaaaagh! Interestingly, the first image was my first converted WB, due to my lack of funds at the time to purchase the lead beahemoth GW WB back in the dark ages before plastic really took off. I ended up doing a whole nob retinue based on ogryn/ogre bodies and ork heads. More pics later. Well here it is, the beginning of my Grot Army! Hi i'm Yellow. 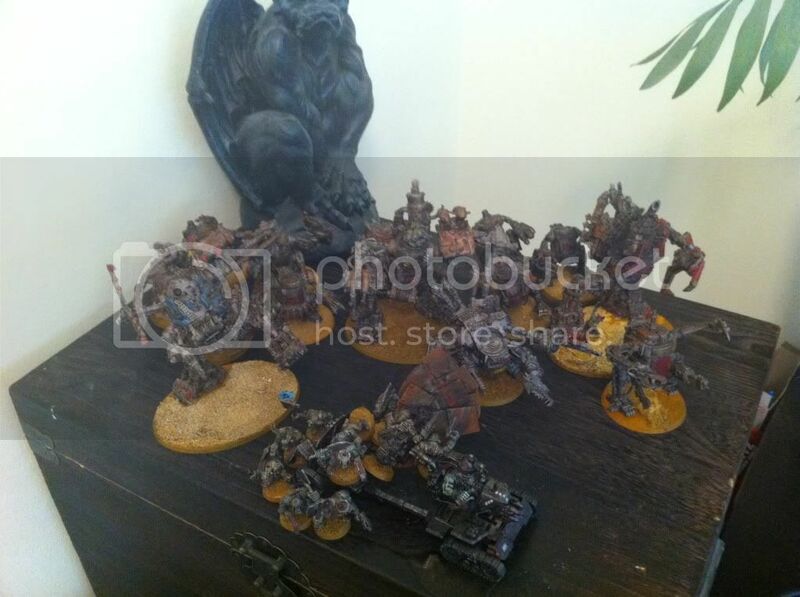 I've been collecting orks for nearly two years now. That is to say I've been quite regularly buying boxes and putting them on my shelf ^^. I've walked past the GW shop many times in my life and sometimes into it too but the prices always put me off. With the release of 40k computergames such as DoW I got a bit more emersed into the 40K universe and since I've always been a fan Orks in any and all universes I played digital Orks alot. 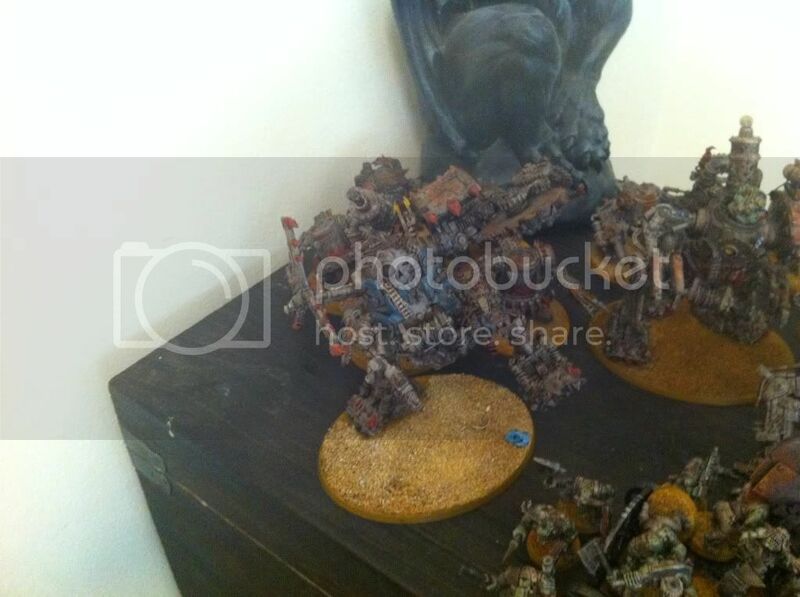 To make use of that I started to actualy buy Orks. I got the AoBR box and exchanged the puny 'umans for another set of orks. And have constantly bought new stuff that I thought might be nice to have ^^. I finally got around to breaking out my box of Boyz! And, I assembled a whole one Ork so far. Oh yeah, I know it's pretty impressive. I'm trying to get ready for a Fantasy tournament here next month, so I have to work on my Chaos, or my Undead. Not too much time for all my projects, but hey at least I started. Hey everybody. I painted my first batch of Ork boyz. And a conversion of my warboss. He started out as an ordinary Nob, then I realized I liked his face, so I added some more bits, and some more bits....then I decided to have him mangle a Chaos champ. I still have yet to paint him but I think he looks quite cool already. 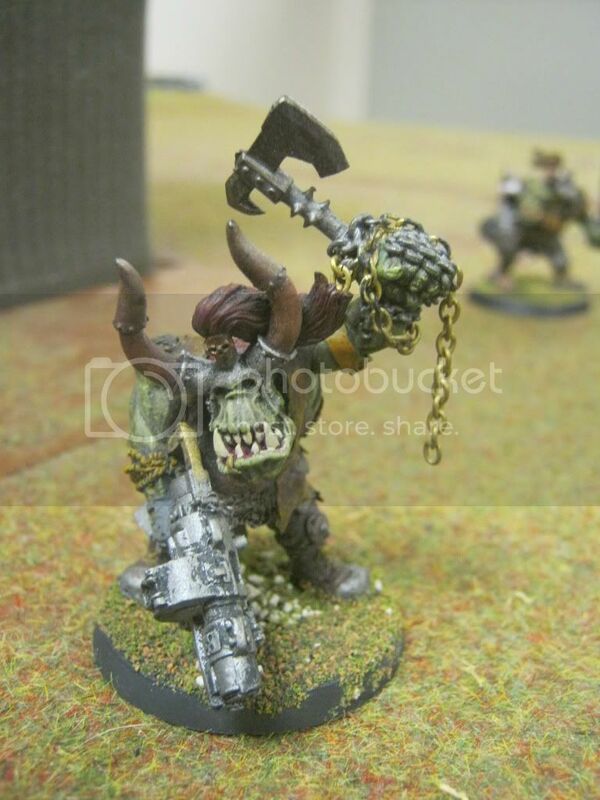 Profile: Running orks recently, simply because I love the background and all the power and fun orks can give to a battle! 1x Deffcoptas conversion: painted at the 25th December as "Zanta Klaus, the angry Khriztmaz zpirit!" Work in progress: At the moment I'm in a low-cash situation so I've no work in progress for now, I will finish paint the boyz meanwhile. In the future I'm going to buy some bikers or maybe a killacan! "Remember Elan: It dosen't matter if you lose or win, as long as you look really cool doing it!" I'm playing 40k now for 3 years with Space wolves and I want to start a new army around the summer or later in the year. As everybody could guess this army is going to be ORKSSSSSSSSSSSSSS. At the moment I'm busy reading a lot about them and searching for what I want for play style. I'll be reading a lot in the mean time and probably going to ask a lot of questions in the hope to settle my mind on style and tactics. I'm gonna start with an army of 1500Pt's and from there on we'll see. Off course I have an armylist in my mind as a starter and it will be on the other part of this forum for Q&R . Thx all for the futere help,pleasure,fun and toasted humiiieeeees !!!!! Hallelujah I suxxxxorzz but i'm having so much fun :-D ! ! ! Hello. I've been a long time time ork player since second edition came out, played through 3rd, skipped 4th and played through 5th. I've recently been on hiatus with my new Eldar army for the past two years and with the arrival of my own little grots, have been kept out of actual gaming for a while now. I'm still an avid putterer and I paint and model almost every evening. I'm hoping to start getting some games in with 6th edition and have pulled out my old boyz to strip and repaint, as well as add some new models to da collection. Unfortunately most of my models are of the older, less grandiose scale so I'm subbing models as I go, to get a more uniformed look. 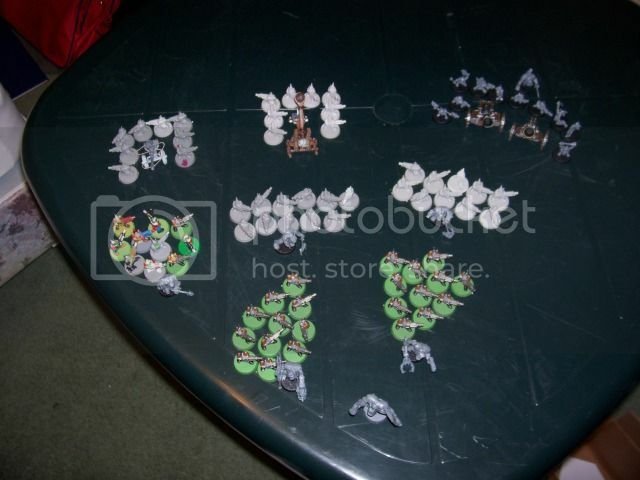 I've almost always played a Deathskull army, with some lean towards Bloodaxes.